Adruu can also take care of the final phase of the production process. Adruu provides the pressing in and/or assembling of products and/or semi-manufactures, both manually and mechanically. Examples of this are applying press-in nuts and rivet nuts and pressing in fasteners and inserts like bushes, nuts and pins. 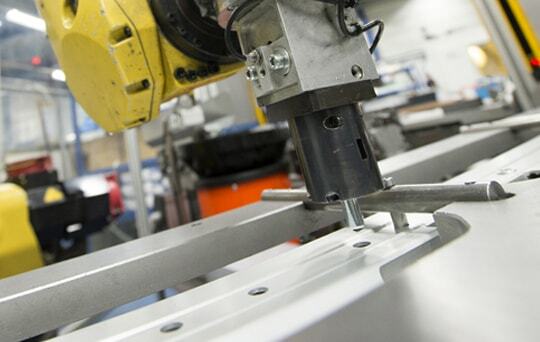 Adruu also performs assembly work using rivets, click connections, stud welding or gluing parts. Adruu can perform these activities for single units as well as for millions of parts a year. We have been pressing in anodized profiles for the automotive sector for years. With our experience of pressing in large numbers of parts and computerizing press-in processes, Adruu delivers high added-value to its customers, making Adruu a reliable partner that stands for quality, price and reliable delivery. To ensure that pressed in and other parts are firmly in place, Adruu has a special press-out force tester.